Posted: Thursday, April 21, 2016. 4:04 pm CST. By Dalila Ical:Guatemalan President Jimmy Moralez has issued a statement following reports of a Guatemalan minor being shot and killed by a BDF soldier. Moralez has declared that he intends to heighten and employ strict protection of Guatemala’s sovereignty in the Sarstoon area and along the Adjacency Zone to ensure that the BDF no longer abuses the territory and population of Guatemala. 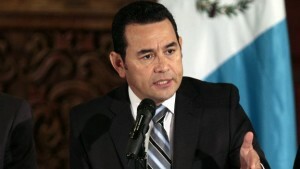 He claimed that Guatemala has displayed “good faith” in finding a peaceful resolution to the Belize-Guatemala Dispute but said the position doesn’t seem to be supported by Belize given the recent events. In the recording, Moralez asks what threat could a child have on Belize’s sovereignty and demanded that the person or persons responsible for the death of the child be arrested and face the law. Furthermore, he has decided to call in the Guatemalan Ambassador in Belize for consultations until the matter is addressed by the Belizean Government. In the report, Moralez says that the child who died was 13-years-old and is still in the hands of Belizean authorities. Julio Rene Alvarado was allegedly shot along with his brother 11-year-old Carlos Alberto Alvarado and father, 48-year-old Carlos Alfredo Alvarado Ramirez. There has not been any report as to what may have led to the shooting. The Guats are not warrior.They fail in Bay of the Pigs.Now the US special forces were training them in the North of Guatemale and still they cannot handle the Zetas.How will they fight us? We do not need any training from The US.Most of us are Born middle east Warriors.I am ready for them!,any time ,any day. Belize is the smallest country in the world that can or will cause a third WORLD WAR.So it is written. que verguenza como nos peleamos. Soy guatemalteco y considero que todo debe solucionarse dialogando. La guerra nunca ha producido sino muerte y dolor. Los insultos racistas no pueden ser tolerados tampoco. Somos centroamerica y el gran problema es que hemos dejado en el olvido un problema territorial que sigue causando tensiones entre los dos paises. Eso deberia solucionarse a nivel de instancias superiores.